I knew I loved the complex flavors of heirloom tomatoes, but now I find that their deliciousness could be the result of some very complex biology. The tomato, according to this New York Times article, has 31,760 genes, or 7,000 more than human beings! ﻿ This is a season of experimenting for NYC Gardener. Every year for the past six seasons, we've planted Brandywine and Cherokee Purple tomatoes along with several other varieties like Aunt Ruby's German Green and Chocolate Stripes. 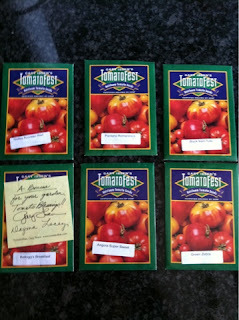 Last year, we didn't even buy new seeds, opting to repeat 2010's choices. This year we're going rogue. We have skipped our standard bearers all together to try out six new varieties. 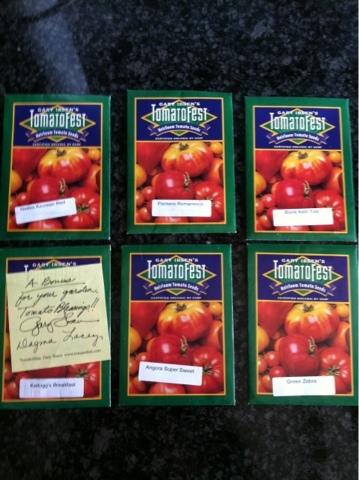 We went to our favorite heirloom seed site TomatoFest and looked through dozens of descriptions for tomatoes that might be just as delicious but easier to grow. I do love the Brandywine and Cherokee beefsteaks, but they take a long time to mature, so the plants are not as productive as they could be. The fruit gets so heavy on the vines that they're at risk to the windy conditions we get on our terrace. Heavy rain often causes cracking. So, this year, we decided to go for varieties that mature a bit earlier and grow a bit smaller. We love green heirlooms, so we chose Green Zebra, a tomato served at Alice Waters' Chez Panisse. We wanted a Roma tomato to make great sauces and the Pantano Romanesco sounded like a hearty and flavorful option. 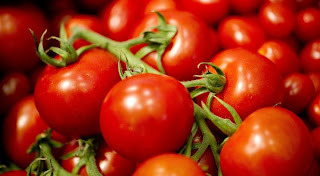 We also picked one of Tomato Fest's top 10 for 2012, the Black from Tula, a Russian import with a smokey flavor. We didn't entirely turn our backs on the beefsteak. We're trying out Neves Azorean Red, "the ultimate sandwich tomato," advertised as tasty, disease resistant and productive until a frost. The only repeat is the Angora Super Sweet cherry, which we planted a few seasons ago and very much enjoyed. Last on our list is Kellogg's Breakfast, an orange beefsteak that came as a bonus from Tomato Fest. It's said to be sweet, tangy and nearly seedless. If all goes well, we should have a bang up crop. Even more amazing, all our plants are out in their pots and basking in the fresh air, more than a week ahead of our usual schedule. So, here's to a season of change! 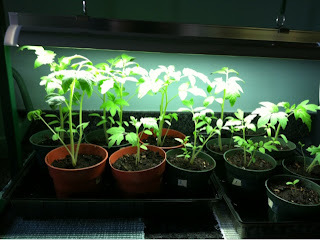 Yes, the season is heating up and our veggie plants are already in varied stages of life cycle, with tomatoes, cukes and peppers in the ground and mesclun already producing copious greens. But believe it or not, we're still enjoying last year's harvest - from our freezer. 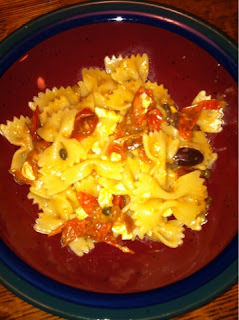 The other night we pulled out a still delicious cherry tomato sauce that is perfect over bowtie pasta with olives, feta, capers and pine nuts. 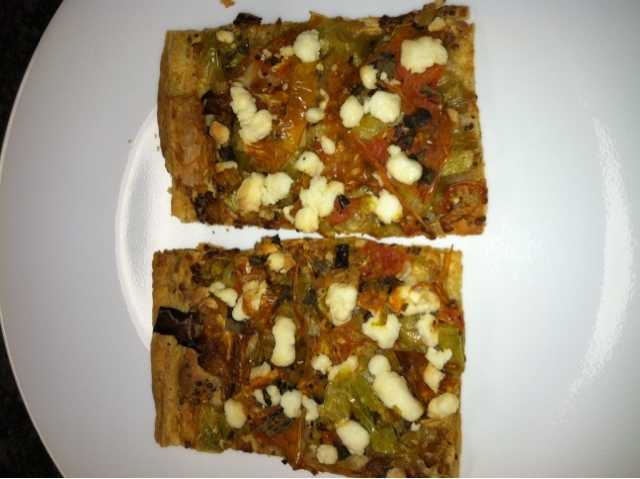 (Click here for the recipe.) I also gobbled up the last of my goat cheese tart slices a couple of weeks ago, another awesome treat. And the other day we made pesto chicken with sauce we saved from the fall. We even have a few more containers where that came from, which should take us right up to this year's first harvest! Seeking stronger tomato plants we decided to invest in a grow light this season. We got this simple Hydrofarm JSV2 2-Foot Jumpstart T5 model on Amazon for just $50. We put our little seedlings under the light and took off for a 10 day trip, giving our cat sitter instructions on how to adjust the system as the plants grew taller (and of course, to keep them watered.) When we came back the seedlings had sprung up like weeds. Though they're still not as fat as green house starters, they're not as spindly as they have been in the years when we depended on natural light. The next step is "hardening off" the plants, or getting them ready for the outdoors. 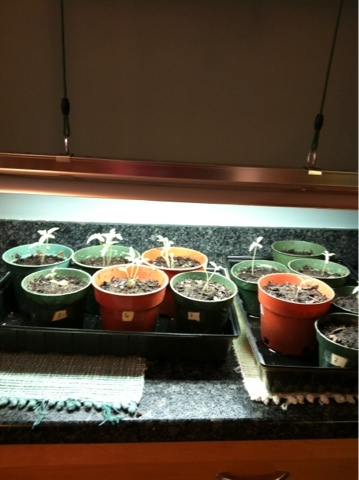 To do this, we put the seedlings outside for a couple of hours before and after work and on the weekends. 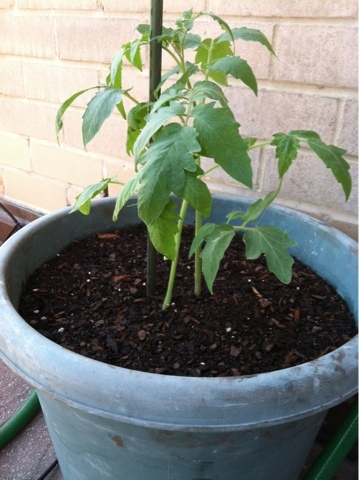 This helps them adjust to strong sunlight, chilly temperatures and windy conditions. It will keep them from wilting or going into shock when we move them to the big pots on the terrace. I am really looking forward to a healthy crop this year! Years ago, I was in an all girl band with a fine bass player, Laura McDonald. These days she's a fitness guru and she has some pretty timely tips about how to make gardening good for you in more ways than just by eating your veggies. All that weeding and planting is really great exercise, she says. Any gardener can get a sense of that from the aches they get after moving pots, lugging soil and lifting watering cans all day. 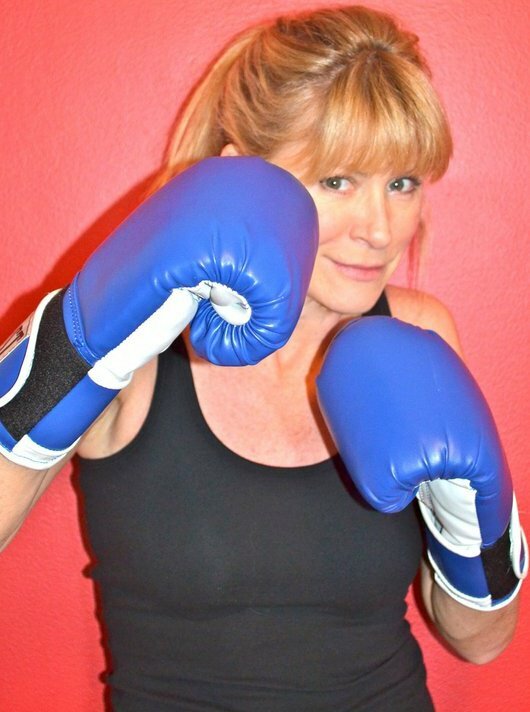 But Laura breaks it down to the muscles we stretch and tone with every bend and twist and the calories we burn. Adding a few squats and dips can make an even bigger impression on the figure. Read her blog post to find out how to make working in the garden a real work out.